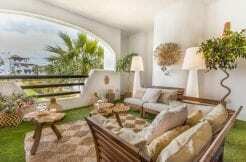 Beautifully ground floor beach apartment for holiday rental in Sotogrande Paseo Del Mar. This wonderful holiday rental apartment is right on the beach front and has its own private garden and small plunge pool. 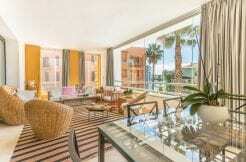 The apartment has 3 double bedrooms, 2 bathrooms a modern open plan style kitchen with all mod cons and living room leading out onto the terrace and garden where there is a small plunge pool. There is air-conditioning and heating throughout the apartment and a private parking space in the underground garage and wifi. This property would be perfect for holiday makers or short term lets. During the summer months you can take a water taxi to the shops and restaurants in the Main Marina.